What do soccer and choir have in common? If you’ve never participated in either, the answer might surprise you. Kids and parents alike love team sports! From soccer to basketball to swim team, everyone loves to be involved. Kids love that they get to spend time with their friends doing something fun and exciting. Parents love that their kids can learn great teamwork skills, including leadership, cooperation and responsibility. 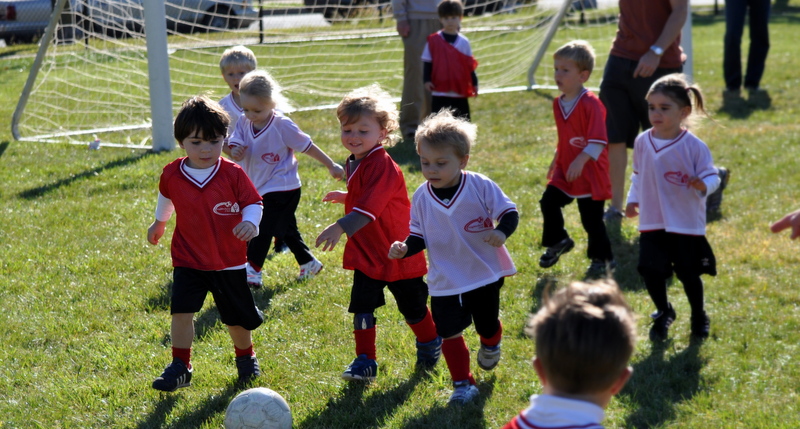 Team sports are a great way for kids to learn these skills and have fun doing it. What lots of people don’t realize is that choir offers these same experiences! One of the most important things about playing on a team is learning to work together. Each player needs to learn how to work with their teammates, and how to know when to step up or when to step back. The same is true for a choir! All the singers in a choir need to learn how to blend their voices, and know when to sing out or when to support another voice part. No one likes a player who hogs the ball, and no one likes a singer who drowns out the rest of the choir! Team sports teach children the importance of responsibility because everyone who is on a team has their own unique part to play. If a player doesn’t show up to practice or doesn’t know the play book, the rest of the team can’t play! Can you imagine trying to field a football team with no quarterback and no linebackers? In a choir, each voice is just as important. If a singer doesn’t learn their music or doesn’t show up to rehearsal, it makes it difficult for the other singers to have a productive rehearsal. As you can see, there are a lot of similarities between sports and choir. Both teach children the importance of cooperation, responsibility, and many other life skills. In addition to these skills, group activities can have positive psychological benefits on children. A study from Oxford Brookes University has shown that people who participate in group activities like sports and choir have a higher sense of well-being than people aren’t involved in group activities. So what are you waiting for? Get your child off the couch and into choir today!